Ages Infant – 5th Grade – With Deep Blue, children will make Bible stories, Bible people, and Bible passages a part of their lives. They will also come to know the Bible as THEIR book and find ways to let the Bible speak to them today! The Deep Blue kids—Asia, Edgar, and Kat—will lead the children through the Bible using animated videos that tell the story. The student resources-the Bible Story Stuff, the Kids Activity Stuff, and the Deep Blue Kids Bible—are colorful and engaging, encouraging the children to “dive deeper” into the Bible and explore their faith in fun and age-appropriate ways. 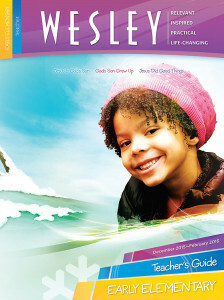 Ages Infant – 5th Grade – Children’s Church provides a more age-appropriate option for your children while parents are in the “big church.” Teaching the principles and truths found in God’s Word is the focus of Wesley curriculum. Week after week, take-home materials and studies will help students remember the lessons they have learned on Sunday and take steps to apply God’s Word to their lives. Wesley curriculum challenges students to be immersed in the love of God’s own heart and encourages them to complete heart holiness. Wesley curriculum is also practical in helping students transfer that holiness to real life where they can share the all-encompassing love of God to the world for whom Christ died. Wesley curriculum combines over 100 years of curriculum development with innovative change in methods and materials without changing the message of our holiness distinctive. Every lesson has a Bible text for its basis. Bible coverage for all age levels is the organizing principle of our scope and sequence. Teachers can be confident that the teaching is sound, and the students are receiving solid foundational truth. Students and teachers alike will appreciate lessons that have a firm foundation in Scripture as they study God’s Word.